The island of Penang sits just off Malaysia’s west coast, connected to the mainland by bridge. 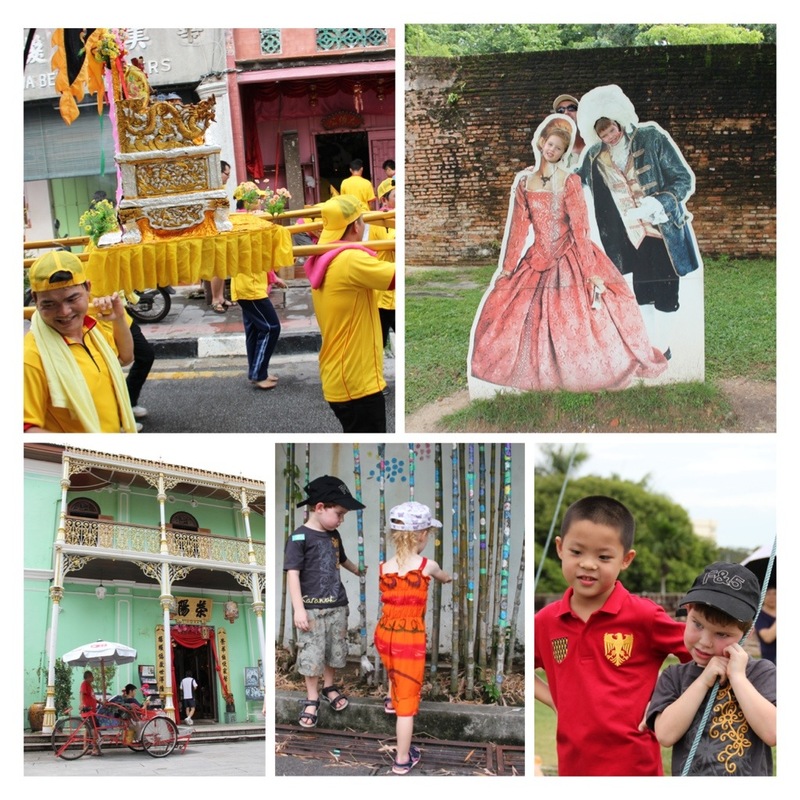 A multicultural melting pot, it’s been British colony, opium trade port, Japanese military base, and electronics manufacturing centre – just a slice of the island’s colourful past. Today, the capital George Town’s Colonial District is a UNESCO World Heritage site, and Penang is recognised as Malaysia’s unchallenged food capital, with a large and bustling Chinatown and Little India, hawker food markets galore, and a rich colonial history, with Chinese clan houses, industrialist mansions, British forts, Buddhist temples, and street art and markets filling the city’s roads and lane-ways. We landed in Penang at nine o’clock on a Saturday night in July, and the air hung heavy, thick and humid, as we left the airport terminal. The kids were spent after a long day and a late flight from Kuching, so we snagged a cab, and they crashed on the drive into town. 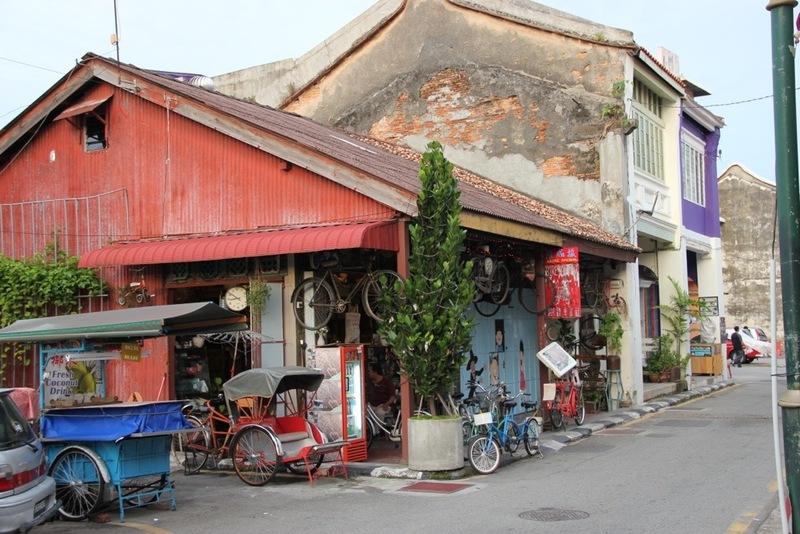 Keen on what we’d read and heard about George Town’s charismatic heritage district, we’d booked three nights in a little bed and breakfast called Spices, in Lumut Lane. 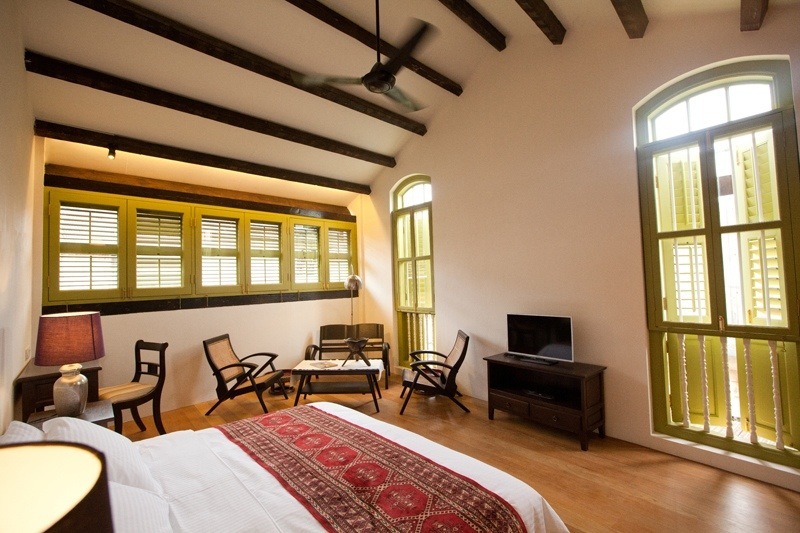 Once a series of shophouses, the row has recently been transformed into a gorgeous little oasis, tucked away in a corner of the historic centre of town. We arrived in the darkened street in our cab, two kids asleep in the back seat. Unremarkable from the outside, the plain front doors opened to reveal a cosy, welcoming foyer, with a swinging lounge, perfect for sleeping twins. We didn’t get a shot of that, but here they are, awake and enjoying the swinging lounge. Leaving our shoes at the door, it felt like home. Our host, Celeste, served up cold drinks, and showed us to our family room, which was an unexpected upgrade from the basic room that we’d booked. Kids settled in their trundle bed down a little ladder in their hideaway, a cracking storm rolled over the island, we watched the lightning and listened to the thunder and rain through the wooden shutters. It was an awe-inspiring welcome to Penang’s monsoon. I’ll never forget the power of that tropical thunder – it was an epic storm. We were really lucky that the rain let up in the morning. The owner of Spices, Karen, chatted to us over breakfast and suggested the best way for us to check out the old town would be by bicycle. It was Sunday, so the roads would be quieter than usual, and we could rent bikes with baskets on the back for the kids to sit in. Heading around the corner to Armenian Street, we found the bike shop sitting quaintly on the corner. I love this place! There was actually a throng there that morning, so we battled through the crowd of tourists and picked ourselves a couple of three-wheelers. Once motorised, they were now pedal-power all the way. I guess you’d call them tricycles. Seated on plastic stools inside their baskets, our precious cargo burst with excitement, and we set out on the town. I think it was $15 per bike for the whole day. ‘Bring them back by seven’ was the only instruction. Paperwork? Pffft! We set off. Needless to say, we were quite the attraction ourselves. Cheeks were pinched, car horns honked, motorcyclists’ heads were turned, pedestrians high-fived. 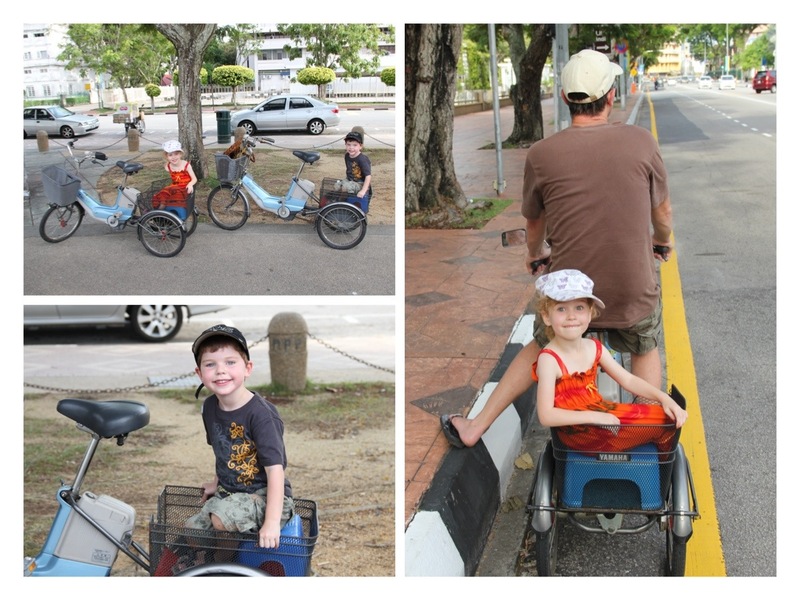 The kids didn’t actually want to stop anywhere – they were having too much fun being chauffeured about. We saw passing processions, stopped by (the unremarkable) Fort Cornwallis for a snap in colonial getup (who’s that photo bomber? ), visited a Chinese mansion, stuck stickers on bamboo (seemed like the thing to do), and made new friends. 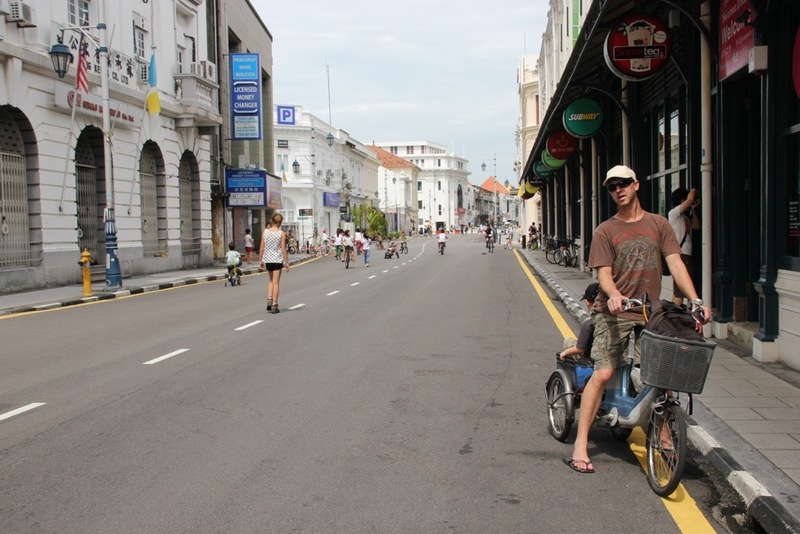 We visited “bike world” – downtown George Town, closed off to traffic on Sunday mornings – it was a cyclists’ paradise! 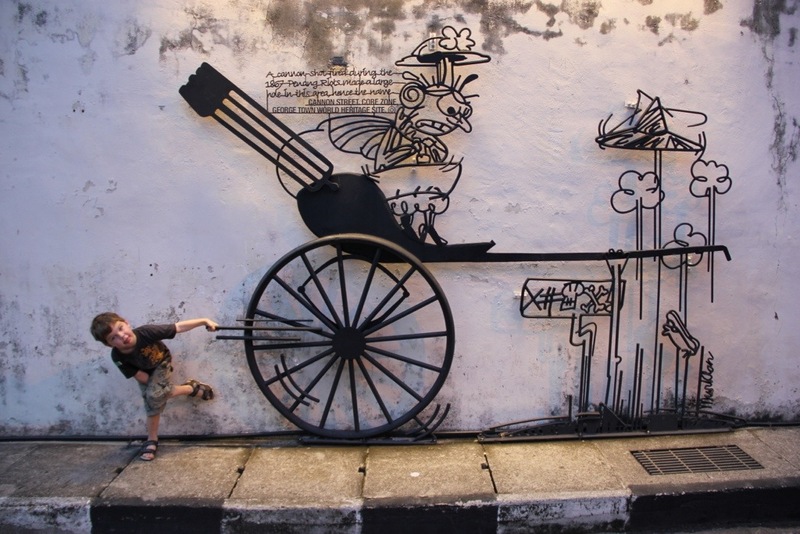 We admired Penang’s famed street art. 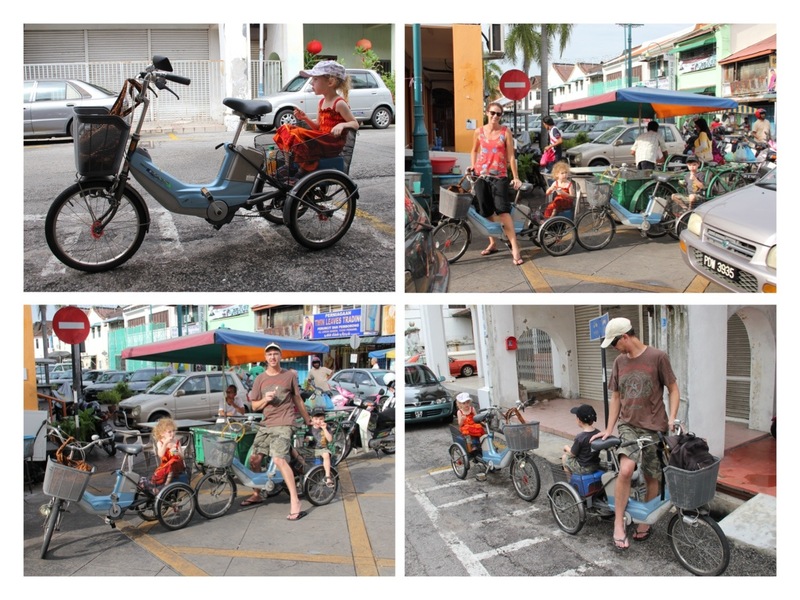 But mostly, we revelled in the ride – rollin’ in Penang on six wheels and having a blast! A big shout out to the team at Spices @ Lumut Lane for making our stay in Penang so comfortable and memorable – great local knowledge, excellent service, and welcoming of kids. Breakfast is fantastic! Read about more of our Malaysian adventures in Kuala Lumpur City Centre Park, KL Chinatown, Batu Caves, staying on the Santubong Peninsular in Sarawak, Borneo, our wildlife-spotting boat trip in Santubong, Borneo, things to do in Kuching, the capital of Sarawak, in Malaysian Borneo, and day trips around Kuching. ← I’m just so angry. Love that street art very cool, awesome photos, reminded me of a warm breeze on a hot day…refreshing and entertaining. The street art is really fun, Kath. So much to see, and just provides such a welcoming vibe to the city. They were the best! I wish I could have ridden in the back. 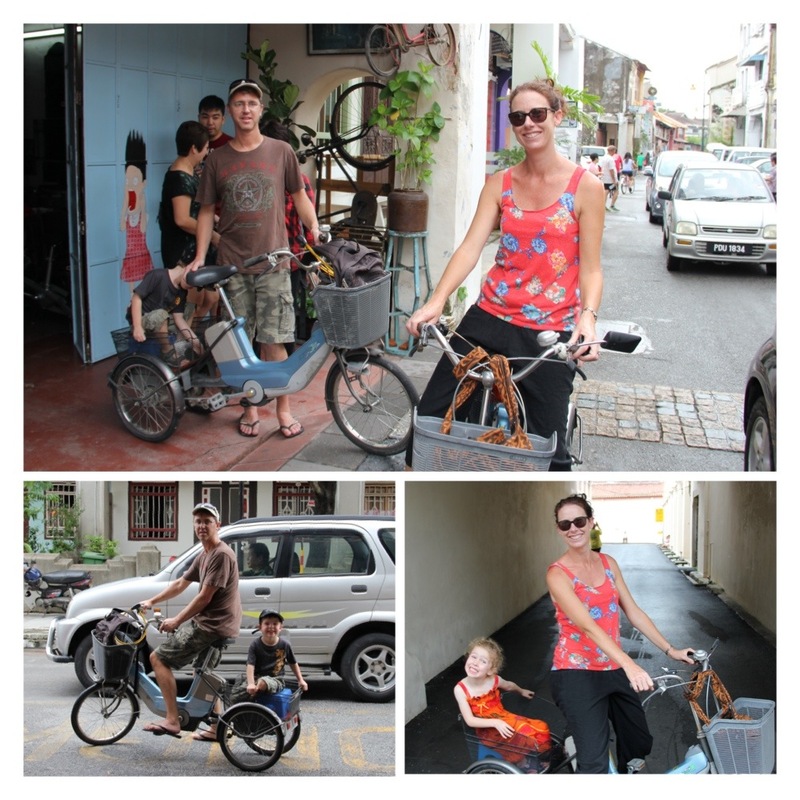 I think cycling is the perfect way to explore George Town with little ones. And for some reason, we have not gotten around to doing it ourselves! By the way, I think you found the most picturesque bike shop in town. I’ve heard other people praise Spices, too. We loved it Michele! (Can you tell?) Haha! Loved the streets closed off on Sundays – what a great idea! Yes, Spices was lovely, mostly because of the people. What a great article. I must say I wish I had twins myself , I think the fun is double this way. I don’t work at Spices but at the sister property called Syok. I am really proud to be their colleague and share these wonderful comments about our accommodations. 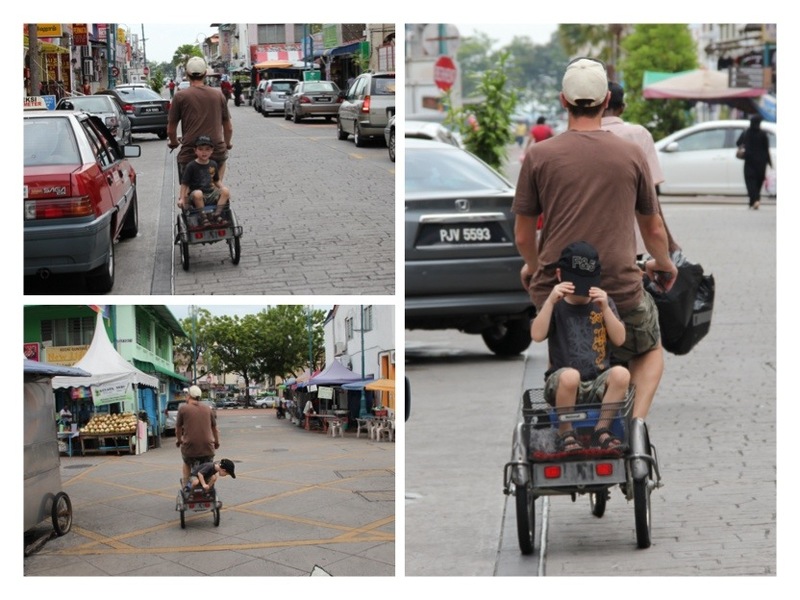 Georgetown is really a gem for adventurous travellers like you and your little ones. Glad to see you made the most of it. Hoping that next time you will be in Penang and the twins are older, we will host you at Syok as well, enjoy a backpacking experience.